Manila’s South China Sea strategy is more about strengthening national unity than changing China’s behavior. On January 22, 2013 the Philippines filed a Notification and Statement of Claim with the International Tribunal for the Law of the Sea, challenging Chinese encroachment within its 200 mile Exclusive Economic Zone (EEZ). Three and a half years later, a preliminary hearing was held this year from July 7-13, with Japan, Indonesia, Malaysia, Thailand, and Vietnam attending as observers. According to an explanation of the case from Manila, Philippines seeks to have the tribunal invalidate “China’s 9-dash line claim to almost the entire South China Sea (SCS) including the WPS [West Philippine Sea]” as well as force China “to desist from unlawful activities that violate the sovereign rights and jurisdiction of the Philippines.” Yet, despite investing in an army of lawyers that has put forth 3,970 pages of supporting documents and data, the Philippines never harbored expectations the tribunal’s ruling would cause China to cease its island reclamation activities or renounce its claims. The Philippines has been keenly aware of this from the onset, and even agrees with China that the tribunal lacks jurisdiction regarding sovereignty claims. Add on the possibility that any final ruling could be thrown out for exceeding the bounds of the tribunal’s jurisdiction, and one is left to contemplate, besides points already raised by the Philippines, what alternative purpose this case serves. One answer lies in the way the Aquino administration has taken action to help further strengthen nationalistic tendencies in the Philippines over the disputes with China. Embodying the saying “never waste a good crisis,” President Benigno Aquino III has latched on to the outcry of nationalists, whipping up nationalism through vocal decrees and executive orders. Other aspects of the IEC campaign include officially adding the West Philippines Sea to Filipino history and geography textbooks. As of earlier this year, plans for doing so were still in the initial stages, but DFA Spokesperson Charles Jose told Rappler.com that the proposal will complement the Philippines’ legal strategy against China by utilizing education and information. He added that the goal of the proposed West Philippine Sea curriculum is to educate Filipinos, not to “brainwash” them into claiming the disputed shoals and reefs. “We will not force students [to think] that the Spratlys, the Kalayaan Island Group, is ours. It’s more of an appreciation of [marine] wealth: how to use it, how to conserve, how to protect and how to manage,” Jose told Rappler. The term “West Philippine Sea” itself serves as a benchmark for when Aquino began his push to foster nationalism. 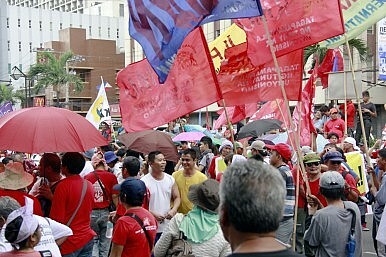 The Philippines government began using the term for internal documents in April 2011. On September 5, 2012 Administrative Order No. 29 was signed, “Naming the West Philippine Sea of the Republic of the Philippines, and for other purposes.” Prior to 2011, Google trends registered no use of the term, making its rise from inception to soon-to-be educational material meteoric. The rise of the term “West Philippine Sea” also coincides with the start of popular protests by Filipinos against China’s maritime claims. Prior to 2012, there are no protests against Chinese claims on record, but since then they have occurred every year (e.g. 2012, 2013, 2014, 2015). These protest are by no means top-down orchestrations, but the editorial rhetoric that actively reimagines what qualifies as a ‘patriotic Filipino’ certainly bears those marks. This conscious shaping of nationalism is not unique to the Philippines. Nationalism often permeates one nation’s reaction to another. Understandably so, for at the international level nation-states provide both an identity (the Nation) to understand one’s place within the larger human community, and an actor (the State) to champion one’s hopes and dreams. When confronted–physically or verbally–internal conflicts are oft forgotten as one’s identity harmonizes behind their State. This is especially true when one’s nation is the perceived victim of another’s aggression. Known as a rally ‘round the flag, this political tool can be found from Putin’s Russia to Aquino’s Philippines. Alexandre Dor is an editorial assistant with The Diplomat.